High Heels —— Tory Burch completes his spring summer 2012 collection of shoes with beautiful mary jane decolletes Beverly line. In this season when they are fashionable styles of shoes in fluorescent colors and shapes sometimes very eccentric, Tory Burch proposes an alternative not bad, ranking it in the wake of world-class brands such as Red Valentino: so here is a mood bon ton and very romantic who becomes the center of a particular line and saucy, a collection that aims to impress with little and proposes models of pumps and high heels that on average the most comfortable heels. We see all the variations of the Beverly line. Any collection that meets a lot of space this year to reserve pumps on high heels, stiletto heels, mainly at times well over 12 cm as they want the dictates of fashion. Tory Burch chooses the way of a simple though refined femininity particularly in the details, it also highlights another trend during this period discovered, that of decolletes a narrow point that many are characterizing collections. The line decolletes high-heeled mary jane Beverly includes models with a red polka-dot print in blue or alternatively, with a cigarette heel height 10 cm and a beautiful bow on the canvas, which you can pull on the strap that runs over the instep. Among the variants there are also special models in leather navy blue, less eccentric, and the golden orange-colored leather version which is really a treat! But there's more! As I said, Tory Burch complete his collection of Beverly pumps with medium heels gorgeous models for all fashion victims who do not particularly like stilettos or that they want something more portable and easy in their wardrobe, as an alternative to the equally amazing dancers Reva. The news is that although in form the young designer has been spared, no one can say the same fantasies and colors! 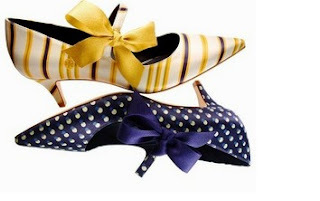 On the official site you will find it a wonderful model with covered heel, detachable bow, the tip narrow and elongated typical French flair, designed with white polka dots on a cobalt blue, but especially the variant yellow and blue stripes on white base that has a flavor casual and carefree. Tory Burch has also considered the most sober-colored leather pumps with ribbon in ecru or navy blue canvas classic complete with glossy effect.